I dithered a bit about sharing this, to be honest, because even by my easy-going standards it is a very simple recipe. But the lemony dressing lifts it and prevents that clagginess you sometimes get from a potato salad made just with mayo, so I’ve included it as a sort of bonus post. It would be very good with smoked fish (with or without the feta). We ate it as part of a summery, salady spread: asparagus and a lovely red-hued lettuce from the veg patch, serrano ham and some hard-boiled eggs provided by the hens. Well, they laid them, I boiled them. This will be even better reprised with our home-grown new potatoes, when they put in an appearance. I used shop-bought Jersey Royals here. Mixing in lemon zest, by the way, also works really well with buttery crushed potatoes. Mix the yoghurt, mayo, lemon zest and juice and chopped mint in a bowl large enough to take the potatoes. Cook the potatoes in boiling salted water until tender (you can peel/scrape them or not, your choice). When cool enough to handle but preferably still warm, cut into 2cm dice, add to the bowl with the feta and mix well. Serve garnished with fresh mint leaves and if you can get them, edible flowers (I used thyme flowers with a few of the tender leaf tips), and perhaps a few sliced radishes. 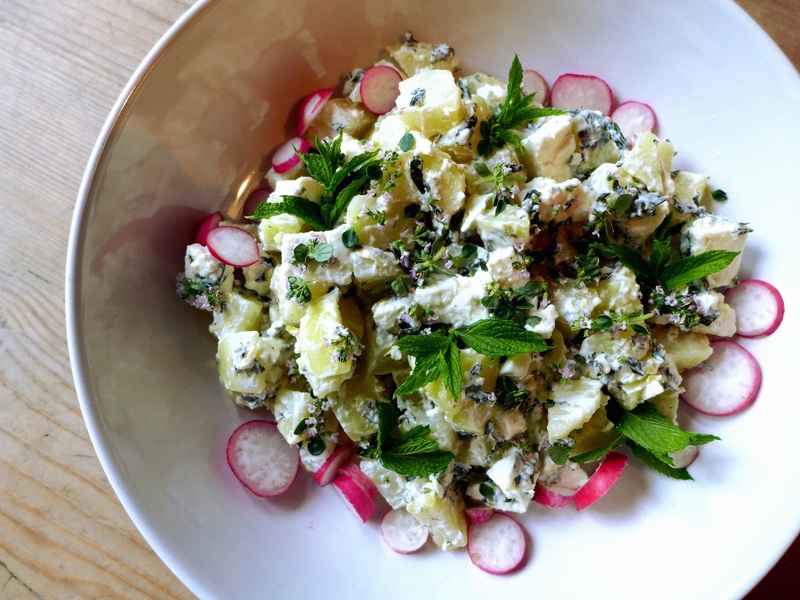 This entry was posted in In the garden, Vegetables and salads, Vegetarian and tagged new potato salad with lemon mint and feta, side salads, summer salads by Linda Duffin. Bookmark the permalink. This would be a welcome sight in my refrigerator when coming in for lunch from yard work. As you suggest, pairing it with some local maple glazed smoked salmon would be a perfect lunch. Have you heard of Cloumage? It is a newer local soft cheese which has achieved a fair amount of foodie press. I’ve been using it in everything to replace or complement mayo, sour cream and yogurt. Don’t blame me for the price over there if you can find it! Thanks again, Linda. I love lemon zest with potatoes. This sounds like just the thing when we get Jersey Royals here. Thanks, Margaret. I don’t know about you but I’ve found the quality of Jersey Royals varies a lot these days – they’re not always unalloyed joy. Quite. They no longer justify their premium pricing a lot of the time. Cornish often work fine for me. Yes, we get some good ones from Norfolk, too. Can’t wait for our home-grown ones to be ready. Yes: definitely! Mrs Mayonnaise and I have never cohabited in the same house and I only use the small new potatoes, unpeeled and always steamed, but this is right up my alley in its light lemony version with its garnishes ringing a whole lot of bells! Really nice. I typically eat radishes with butter and salt, and never think about using them in other dishes. Shame on me!!! Thanks, Mimi. Yes, we do too, but I like that peppery crunch with a potato salad.